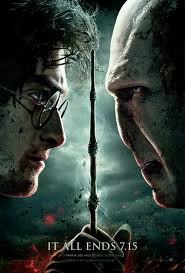 Mathew: So, it's really weird to think I've spent ten years watching Harry Potter movies and this one was the last one. Helm: T'is actually quite sad. Mathew: You mean the movie is sad or that you're sad the series is over? Helm: I mean it is sad that you have spent ten years watching these movies. Mathew: Come on. Don't be like that. I'm being serious. It's weird to be able to look back on a decade of these characters on the big screen. I feel like I have a history with them, like I've watched them grow up. Why, it seems like only yesterday that Daniel Radcliffe was just a child. Helm: And now he is grown, but you are still just a child. How is that possible? Mathew: Always got to be a hater, don't you Helm? But I think the gruff thing is just an act to cover the fact that this movie actually got to you. Didn't it? I heard you sniffling! And more than once, too. Helm: The last book was, of course, better than this film. Mathew: Sure, sure. But everybody knew that would be the case going in. The surprising thing was that the film was actually pretty good despite not being as good as the book. Helm: I do not understand, however, why they feel it necessary to alter key moments in the story. The book was well crafted and paced. The changes did not really improve it. Mathew: Yup. Agreed. With a few of the changes, it was kind of obvious why they changed stuff, but a lot of them seemed like just, you know, gratuitous messing around. Helm: And I was somewhat disappointed by a few moments that should have been bigger in terms of their emotional impact. For example the deaths of certain characters seemed a bit glossed over or underplayed. Mathew: True. Especially, you know, that one particular death. Mathew: Okay, but those points aside, pretty cool? Helm: Yes. Pretty cool. The film is worth seeing on the big screen. But probably only if you have seen the other films. I do not know that it would work as a film entirely on its own. Helm: Would you mind putting in one of your Harry Potter DVD's before you go to bed? Mathew: Mind? Not at all. I was actually thinking I might just run all seven of the other ones back to back and stay up all night watching them. I don't sense any evil afoot. You in? Helm: I am. But the first two are truly awful. And the third is little better. Mathew: Truly. But, I kind of feel like we have to watch them all. Helm: Damn that Chris Columbus.